Dec 19, 2016 (LBO) – Malaysia and Sri Lanka will consider the possibility of free trade agreement, a joint statement said, after the official visit of President Maithripala Sirisena to Malaysia. 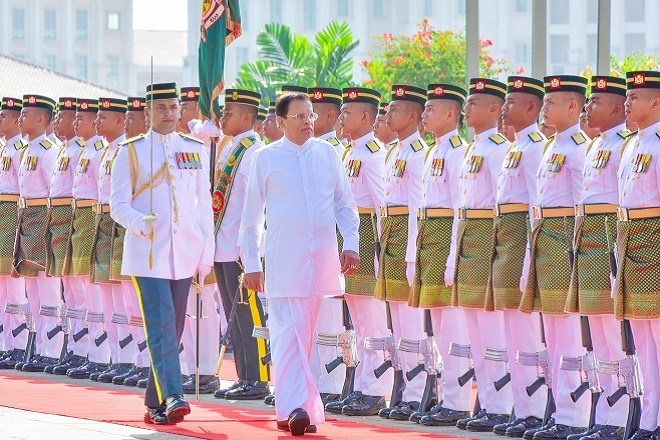 President Maithripala Sirisena was on a visit to Malaysia last week at the invitation of Malaysia’s Prime Minister Abdul Razak, during which five memoranda of understanding were signed. They were on: Tourism Related Activities; Cooperation in the field of Youth Development; Recruitment, Employment and Repatriation of Workers; Culture, Arts and Heritage; and an MOU between the Sri Lanka Council For Agricultural Research Policy (SLCARP) and Malaysian Agricultural Research and Development Institute (MARDI) on Scientific Research and Technical Cooperation. Both leaders said they would like to boost bilateral relations. This would be through increased cooperation in political, trade and investment, education, tourism, human resource, training and cultural relations as well as people-to-people contact, a statement said. Sirisena apprised Razak of the status of the national reconciliation process, constitutional reform and economic development strategies undertaken by the National Unity Government. They welcomed interest shown by Malaysian companies to partake in the business opportunities provided by Sri Lanka, and recognized the presence of a large Sri Lankan community in Malaysia. Malaysia would continue to promote the moderation agenda and mediation approach, promote the enhancement of UN peacekeeping operations, support peace building in countries emerging from conflicts and encourage continued discussion on the comprehensive reform of the United Nations Security Council. President Sirisena invited Prime Minister Razak to visit Sri Lanka at a mutually convenient date, which he accepted.